Design and install foam-water fire protection systems for high-challenge fires with the 2015 Spanish NFPA 16. Used primarily in settings that use or store hydraulic fluids or other flammable liquids, NFPA 16: Standard for the Installation of Foam-Water Sprinkler and Foam-Water Spray Systems outlines requirements for the design, installation, and maintenance of systems for reliable fire protection. 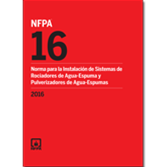 Consult the 2015 Spanish NFPA 16 for the latest on components; water supplies; design and installation; acceptance tests; and inspection, testing, and maintenance. Systems are to be designed with the required density for either foam or water application as the controlling factor, depending on the design purpose. Updates in NFPA 16 help designers, installers, and facilities managers avoid errors and conduct timely testing and approvals. The revised definition of foam-water systems reduces the risk for misapplication of an excessive water application on a flammable liquid fire prior to the foam discharge. A new requirement helps ensure the proportioning system can meet the actual calculated system discharge demand at the most remote (4) sprinklers. This change assists facility managers and testing personnel in carrying out the test thoroughly. Updated test forms follow the same familiar format as NFPA 13: Installation of Sprinkler Systems, to promote timely system approvals.